On July 4th the Russian Academy of Sciences held a special Symposium in Moscow to celebrate the 100th Birthday of Alexandr Mikhailovich Prokhorov (July 11, 1916), who shared the 1964 Physics Nobel Prize with Charles Townes and Nikolai Basov for the invention of the concept of the laser. Prokhorov passed away in 2002 at the age of 87. Reminiscences were presented by the current director of the General Physics Institute, (now named after Prokhorov), Ivan Shcherbakov, the President of the Russian Academy of Science, Vladimir Fortov, Academician Evgenii Dianov, and invited guests, Norbert Kroos from the Wigner Institute in Budapest, and Martin Richardson of the Townes Laser Institute at the University of Central Florida. Richardson spent six months in Prokhorov’s laboratory in 1974, under a scientific exchange program between the (then) Soviet Academy of Sciences and the National Research Council of Canada. 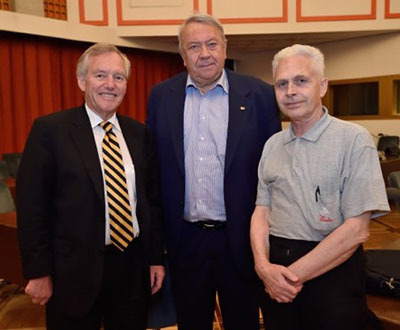 Shown left to right: Martin Richardson (Townes Laser Institute, USA), Academician Vladimir Fortov, President of the Russian Academy of Sciences, and Professor Mikhail Schelev, director of the Photo-Electronics Department of the Prokhorov General Physics Institute. July 4th, 2016 (photo courtesy of Mikhail Konyshev). 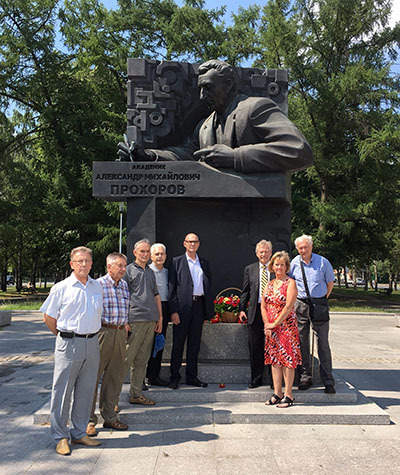 Earlier in the day, Richardson and his wife Kathleen Richardson, also a professor at UCF, accompanied the director of the Prokhorov General Physics Institute, Ivan Shcherbakov in laying flowers at the new monument (unveiled July 9th 2015) to Alexandr Prokhorov located on Leninskii Prospect in Moscow. Prof. Shcherbakov in black is on the left with Professor Schelev. On the right is Dr Nikolai Vorobiev from the General Physics Institute, who has worked many times at UCF.